I headed out to play some Ingress this afternoon, only to be forced back before I even reached my first portal. I suffered from near-catastrophic boot failure. 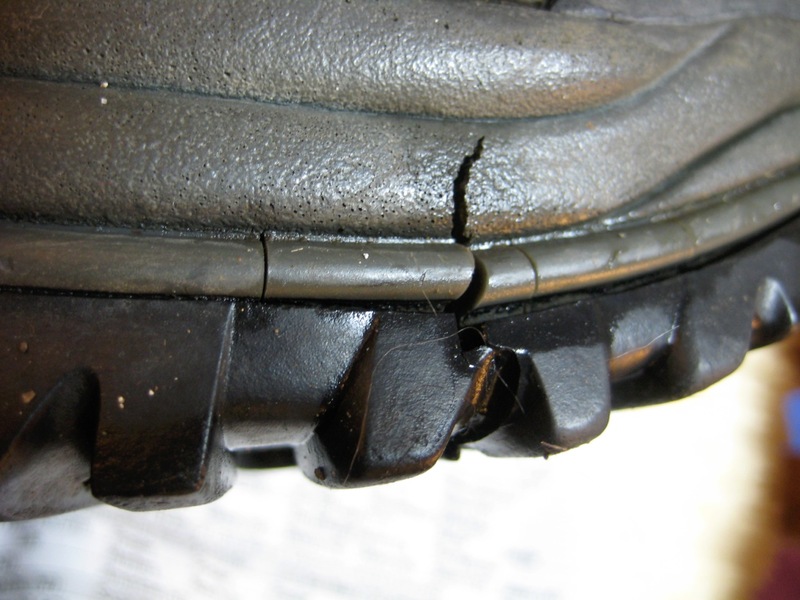 Both boots had developed a crack in the sole and mid-sole, right at the ball of the foot. It’s possible that the crack had been there a while—it wasn’t noticeable as long as I was walking on cleared sidewalks. But as soon as I started walking through snow, it failed badly: Snow started accumulating in the crack, forcing it wider, and forcing my toes to bend backwards. Once I returned to dry pavement, a few steps knocked most of the snow out, allowing my toes to straighten out again. The crack didn’t immediately let water in, so I actually considered continuing. But a few seconds of contemplating total boot failure at a point where returning home would require walking a mile through slushy snow, I just turned around and headed home. Happily, these are my old, summer boots. I only got them out today because my winter hiking boots had gotten wet on each of several outings in a row, and I thought it would be best to let them dry completely, and then reapply their waterproof coating before wearing them out in the weather again.